Singapore, 15 April 2010 - With only two weeks left for fans to benefit from early-bird savings for the 2010 FORMULA 1 SINGTEL SINGAPORE GRAND PRIX, Singapore GP is offering yet another reason to buy tickets before May 1st. Singapore GP has specially reserved for 25 lucky ticketholders the chance to win a pair of tickets to see their favourite FORMULA ONE drivers up-close at an exclusive Driver Autograph Session. Fans who purchase or have already purchased their tickets during the early bird phase (1 March to 30 April) enjoy up to 17% savings on ticket prices sold in the regular phase, which starts on 1 May 2010. To participate, early bird ticketholders just need to register their ticket transaction number (listed on the confirmation email or receipt) on the official Singapore GP website, www.singaporegp.sg. 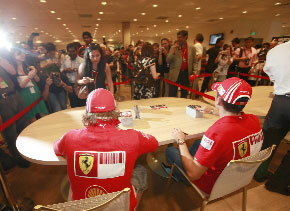 Tickets bought through Singapore GP's official agents will automatically be entered into the draw. 25 winners from the ballot will be notified by email, and will receive a pair of tickets to the autograph session and an exclusive pre-event cocktail reception. Applications for this draw will close on 1 May 2010 (11.59pm, Singapore time).